On our way back from the stone forts at Kimego west we decided to locate this stone pair. On the OS map it is indicated as a stone row. 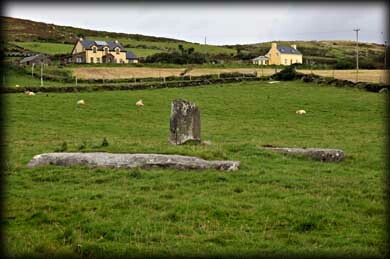 The stones are lying to the east of the first house up the hill. The householder kindly gave permission for us to photograph the megaliths. 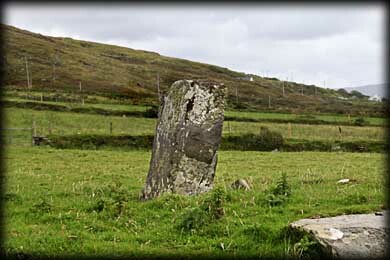 One of the stones is lying prostrate and the second stone appears to have broken at some stage. There is a stump about one metre high and the remaining 2 metres is also lying prostrate. It was quite disappointing to discover that both stones had fallen. Situated: From Cahersiveen Community Centre turn onto Bridge Street. After 800 metres turn left at the crossroads. Then 1.6K turn right up the hill 450 metres. The stones are in the garden of the first house on your right. Discovery Map 83: V 4504 8092. Last visit Sept 2012.